Hristos Voskrese! Christ is Risen! 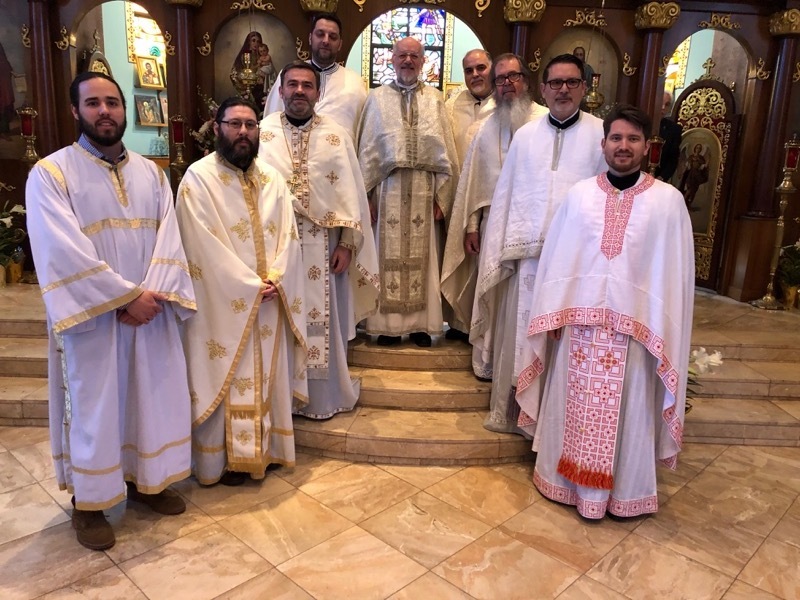 Father Branislav Golic, parish priest of St. Elijah Serbian Orthodox Church in Aliquippa, Pennsylvania hosted the clergy of the Pittsburgh Deanery for the Divine Liturgy on Bright Tuesday, April 10, 2018. 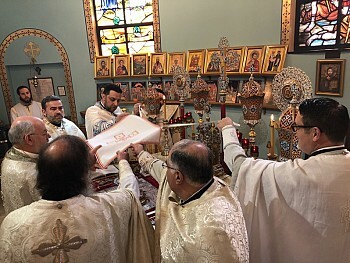 Clergy participating in the Paschal celebration in addition to Father Golic included Dean-Protopresbyter Stavrofor Rade Merick, Protopresbyter Stavrophor Dr. Rodney Torbic, Protopresbyter Stavrophor Rajko Kosic, Protopresbyter Dejan Barac, Protopresbyter Rumen Stoychev, Very Reverend Presbyter George Veselinovich and Presbyter Sasa Nedic. Besides Aliquippa, parishes represented were from the Pennsylvania communities of Carmichaels, Midland, Monroeville, Pittsburgh and Youngwood. Steubenville, Ohio and the Mission parish from Fairmont, West Virginia were also represented. Pascha joy radiated throughout the St. Elijah Church. Following the Gospel reading Dean Father Rade Merick spoke with conviction about Christ’s Resurrection and the real meaning for believers today. Rich Chesla, Robert Baron and Stevan Kosic assisted in the altar. Choir Director and Kolo President Cathy Loverich and Mothers Club President Lynn Popovich participated in the Divine Liturgy and assisted with the luncheon. Popadija Dragana Golic graciously provided the joyful luncheon for all the attendees following the Divine Liturgy. Protinica Danijela Barac added to the singing in the Divine Liturgy and at the luncheon afterwards. Tutors Thomas Leydig, John Tomei and Ted Belich were a welcoming presence for visiting clergy and faithful. This Deanery celebration at St. Elijah Church served to increase the regional Paschal joy and reflected the strong unity among the parishes of the Pittsburgh Deanery. Unity in Christ is the desired and supreme unity for all believers. In December 2017 the St. Elijah Church hosted the Pittsburgh Deanery in celebrating St. Mardarije. In March of this year, His Grace Bishop IRINEJ utilized the St. Elijah Church as the site for clergy confession for the whole Diocese. This parish also hosted the parishes from Carmichaels, Midland, Pittsburgh, Steubenville and Fairmont for Deanery Vespers on the Second Sunday of Great Lent. When parishes join together in celebrating the Divine services, the richness of the life in Christ is shared to a greater degree. St. Elijah Church has a well- established history of benefitting Christians well beyond the parish boundaries. Thank God for Father Branislav and Popadjia Dragana Golic and faithful of St. Elijah Church for hosting this Bright Tuesday celebration. Thank God for the vising priests and faithful for manifesting their love of the Risen Christ. May Christ’s Resurrection continue to shine brightly in the hearts, minds and lives of believers in the Pittsburgh Deanery and in communities throughout the world.